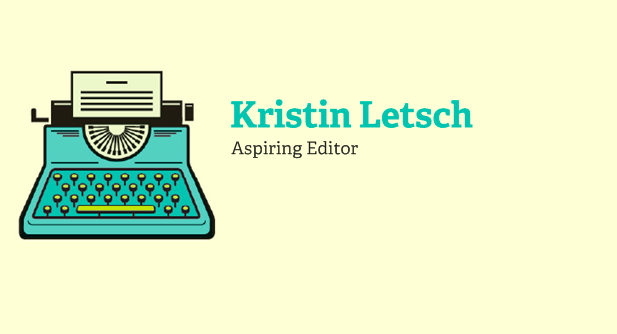 Kristin Letsch, Aspiring Editor – Cats, Chocolate + Commas. I’m from Long Island, about a 45-minute train side to New York City, the arts and entertainment capital of the world. I was very fortunate because I grew up with an appreciation of the arts: films, books, music, theatre, dance. Ever since I was little, I’ve always loved reading, whereas my older sister, on the other hand, hated it. I’ve always been an introvert, feeling more comfortable curling up with a good book than talking to people. Therefore it comes as no surprise that English was my favorite subject throughout all my years of schooling. I received 100s on spelling tests and As on essays and other assignments. When it came time to apply to college, I knew I wanted to be an English major. I received many of those discouraging comments like, “So what are you going to do with your English degree?” I had no idea. I just knew it was something that I loved and would make me happy. My dad always said, “Do what makes you happy.” So that’s what I did and my parents supported me all the way. I received my Bachelor of Arts in English Literature and Rhetoric from Binghamton University in New York. I still had no idea what I was going to do with my life, but I loved my time in college both academically and otherwise (it’s where I met my fiancé too!). Many of my friends would ask me to edit their essays, which was great practice and when I became interested in editing. I loved my major, while many of my friends were miserable in accounting or some other “practical” field — yet they knew they were guaranteed jobs; there was security. During my undergrad, I was a reporting intern at a local news station and a reporting intern at my college’s magazine. I also was an editor for Her Campus and really enjoyed this position. Last summer, I was a production intern at Time Warner Cable News and worked for the University of Florida’s student newspaper for a year. Publishing seems to be a hard industry to break into — and one that many say is dying — but I’m trying. Although I’m getting my MAMC and haven’t had the time to read for pleasure in forever, my love of literature has never waned. I don’t regret going to graduate school, but it’s made me realize what I want to do in life and would make me happy: something, anything with books. I graduate in August and believe my various journalistic experiences have prepared me well for a career in publishing. Editing for news is different, but I look forward to the challenge and learning the process of how a manuscript becomes a book (which this video does a very good job of explaining!). I think publishers have been slow to take advantage of the Internet and social media. I’ve got some ideas I’d love to share with you. I’m a voracious reader. I read anything and everything. It’s hard to say what my favorite book is, just as it is for any movie lover, but I’d say The Lords of Discipline by Pat Conroy is up there. I don’t care what anyone says, Nicholas Sparks is one of my favorite authors. Many think he writes sappy romance novels — they’re not wrong — but they’re so much more than that. I’m a classics girl who loves her Jane Austen and Shakespeare as well as The Great Gatsby, Water for Elephants, the LOTR series, the Millennium series by Stieg Larsson, Perks of Being a Wallflower and so many more. But of course, the books are always better than the movies. Check out my Pinterest board to see my favorites and other with book-related things. I love reading about new books coming out, in addition to older ones I’ve never even heard of. 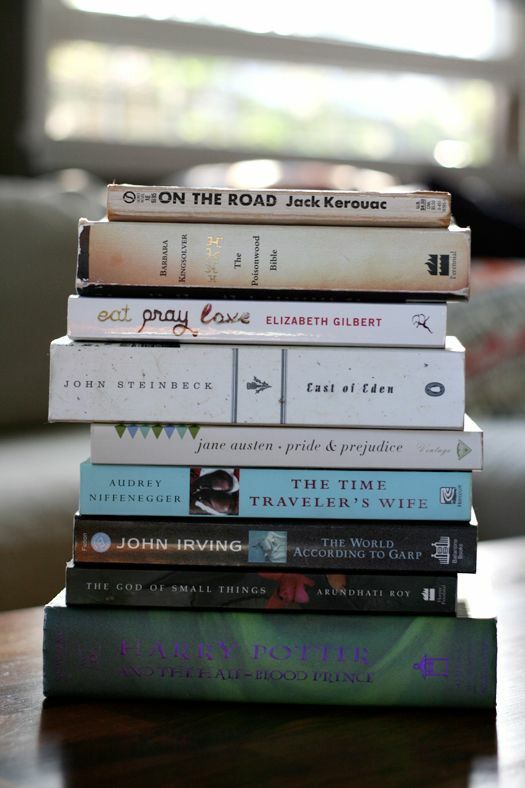 In the video below, author John Green talks about books that were not bestsellers. He’s right, I haven’t heard of any of these, but they’re on my list now. Also, I must say that Green is doing a great job of using multiple platforms to connect with his fans. More authors should be doing this so that they’re accessible to fans. Besides cats, chocolate and commas (obviously). I enjoy traveling, seeing new places and tanning. One day I will complete “The Ultimate U.S. Road trip Reading List” — super cool! If you want to know what happens next in my story or be a part of it, please feel free to check out my website or connect with me on Google+ or LinkedIn. I’d love to chat.